On August 22, I had the pleasure to attend the lecture of Conductor Benjamin Zander in The Hague (new Zuiderstrand Theater, Scheveningen). It was a very inspiring two hour talk. If you don’t know Benjamin Zander I strongly recommend to watch one of his TED talks (maybe my all time favorite) The Transformative Power of Classical Music. The talk in The Hague was based on his concept of The Art of Possibility, which is also a book under the same title. Incredible how he could engage and inspire an audience of approx. 500 people and talk for more than two hours. At the end, as a sort of grand finale, we sang all together Freude schöner Götterfunken, a-capella 500+ people without orchestra. Everyone got a hand-out with the text. 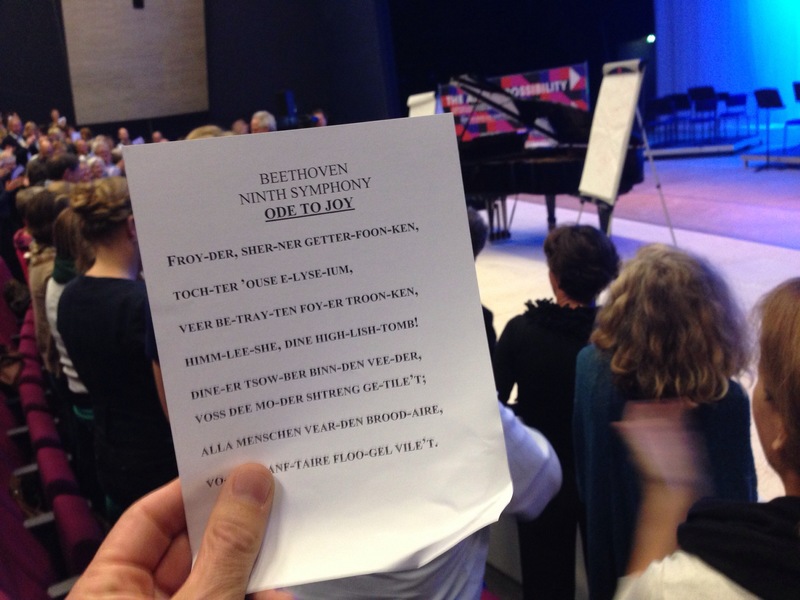 Assuming that most of the people could not read and pronounce the german words in the right way, the text was written in pidgin-crazy-english and everyone could sing it – this was very effective as amazing! A great performance I will never forget with a lot of inspiration and Music Thinking. This was also a good example for one of the Music Thinking principles: SCORE – the visualization of guiding principles. With SCORE it is less important to describe the vision of your project, but to write actions in the way the people you want to inspire and guide can understand and use.